Pai Gow Poker was originally a Chinese gambling game. It was not played with cards but with tiles. 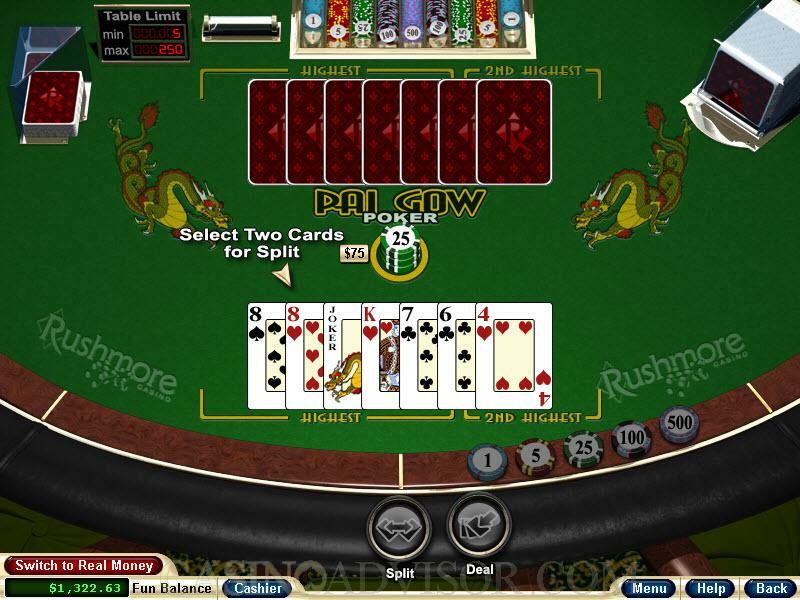 The online version of Pai Gow Poker is played with cards. Poker hand rankings are used to decide the winner. All the features required to play the game are displayed on the screen. The banking section including the player’s balance and the Cashier button are shown at the bottom left corner. The chip denominations are placed on the right of the casino table. The buttons with which the player operates are at the bottom center. Only the buttons that can be immediately exercised are active. The betting area is in the center of the table. The game begins by the player clicking the chips of the denomination he wants to wager. This automatically transfers the chips to the betting area. To withdraw the bet the player has to right click on the chips one chip at a time. The player next clicks the Deal button. Seven cards face up are dealt to him, while the dealer’s seven cards are dealt face down. The player has to create two hands from the seven cards. The high hand has to have five cards and the low hand has o have two cards. The player clicks on the cards he wants in his low hand. The high hand has to be higher in poker hand rankings than the low hand. If the player violates this rule then the software issues an error message and the player has to select another set of two cards. After bifurcating his hand the player clicks on the Split button. Not only is the player’s hand separated as he desires but simultaneously the dealer’s hand is also separated. The high hands are compared and independently the low hands are compared and the payout is made as per the rules of the game. Text messages are displayed as to whose hands are better in each of the cases and the outcome of the hand. and a new bet is placed. If the player wants to place a different wager then he should click on appropriate chips and follow the procedure described earlier. The sound consists only of the cards being dealt. The dealer’s voice announces only player’s wins and pushes. Both the sound volume and card speed can be adjusted continuously over a given range. 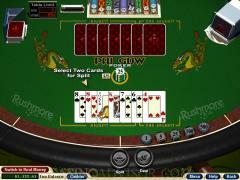 Interested in reading more detailed information about Realtime Gaming Pai Gow Poker? If so Click Here for more details.